When I think about the most beautiful gardens I have ever seen, my mind’s eye goes not to the flowers or the foliage in these spaces, but to the sculptural shapes of the trees and shrubs. I can recall many such stand-outs; a magnificent wisteria, masterfully pruned against a stone wall in Positano, Italy; a spectacular, dark skeleton of a Japanese maple silhouetted against blazing vermillion foliage on an October afternoon; a curvaceous stand of kalmia latifolia worked into a haunting arch. So much of what makes a garden memorable is structure. Pruning, when done with artful and surgical precision, can transform an otherwise cookie-cutter garden into magical and memorable architecture. 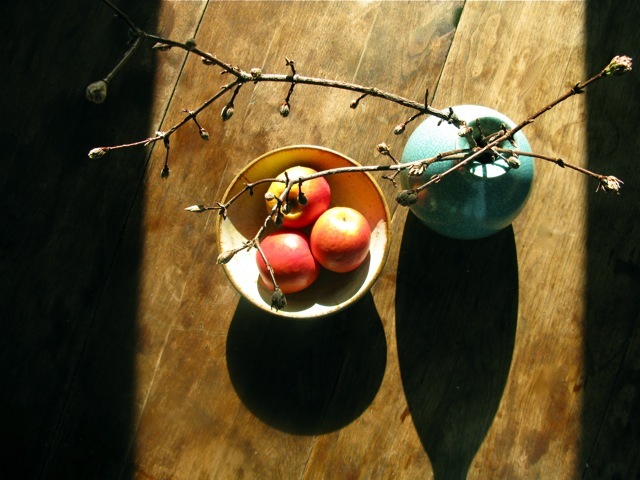 But beyond aesthetics, why do gardeners prune? And how is it done correctly? 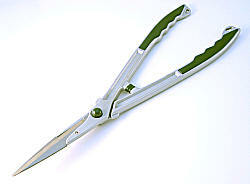 I have seen otherwise confident gardeners run in the opposite direction when confronted with a pair of Felco 8 pruners. And is it any wonder? After years of observation, I can understand the fear created by the horrific end-results of ill-considered, suburban hack-jobs with loppers and shears, (strange yellow balls of forsythia and mutilated yew spring to mind). Many gardeners would sooner allow their shrubs to become tangled masses of neglect and ruin than subject them to such hideous fate. However, both approaches are as unhealthy, incorrect and unsightly as they are unnecessary. It is important to know that proper pruning not only creates beautiful specimen trees and shrubs, but it is also important to the health and longevity of our garden plants. Broken limbs, rodent or deer gnawed twigs, and crossed, rubbing branches are an invitation for disease, deformity and death. Untended shrubs can block windows and doorways, crowd out other plants, and ruin property. Larger trees with damage can be truly hazardous. Properly pruned trees and shrubs in the garden will be healthier, and produce more abundant foliage, flowers and fruit. Any gardener, with practice and determination, can learn to prune and prune well. The basic principals of cutting are quite simple, and with practice comes confidence. The second part of pruning, the art of this skill, comes with time, observation and discipline. The first step in pruning is to have the proper tools on hand, and to know how to care for those tools. 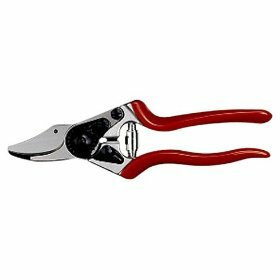 Most gardens can be maintained with four basic pruning tools. Always purchase the best tools you can afford. The most important of the four is the bypass pruner. I prefer Felco #8’s. Cared for with a whetstone and oil, Felco pruners will last a lifetime. Most pruning tasks involving twigs, stems and small branches are best handled by this device. The next tool on my beginner’s list is the Grecian saw. Invaluable for its ability to cut in tight spaces and fold away in a pocket, this saw will quickly and cleanly cut through most branches and small limbs, particularly those in tight spaces. Larger limbs are best tackled with a bow-saw. Purchase a good bow saw; one with a replaceable blade. A good, sharp pair of pruning shears is the final tool on my basic list. Even if a gardener has no use for hedges or cone shaped conifers, pruning shears are a great tool for cutting back perennials, ornamental grasses, and for shearing woody plants such as spirea, caryopteris and buddleja davidii. All pruning tools should be kept good and sharp with an oiled whetstone, and well cleaned, (after cutting each specimen), with a rag soaked in rubbing alcohol. Your tools should always be dried, oiled and stored in a moisture-free environment after use. Once you have assembled your basic tool kit, it is important to consider the plants you will be pruning. Learning to correctly identify trees and shrubs and researching their growth habits, bloom times, forms and preferences, is key to knowing how to get the most from the larger plants in your garden. Some trees and shrubs will require little pruning, and others will require regular and aggressive attention from the gardener. Begin by studying the difference between opposite and alternate bud patterns on branches, as this will allow you to correctly decide when to make shallow angled or straight pruning cuts. Understanding how the plant will respond to your pruning will help you decide on where to cut branches to direct new growth, or how to check growth on the plant. And knowing when to do your cutting will give you the results you hope for. I recommend that gardeners buy a good tree and shrub identification book or two. George Symonds, The Shrub Identification Book, and Michael Dirr’s encyclopedic, Manual of Woody Landscape Plants, are certainly good starts. A book with good photographs, such as Dirr’s Hardy Trees and Shrubs, by Michael Dirr, is also helpful. 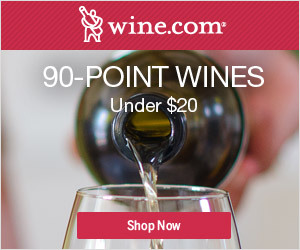 And a good instructional book, especially Lee Reich’s The Pruning Book, from Taunton Press, is key for the beginner. Haunting local nurseries and arboretums may also help with memorization and enhanced visual recognition. A great arboretum will offer a gardener the opportunity to see mature tree and shrub specimens properly planted and pruned. Research combined with experience is the best teacher. Working with an experienced pruner, if you can find or hire one, is ideal. Once armed with the proper tools, and with a bit of research, it is time to practice cutting. This process will be less stressful if the gardener begins on less-desirable plants, or scrub brush in the corner of the yard. 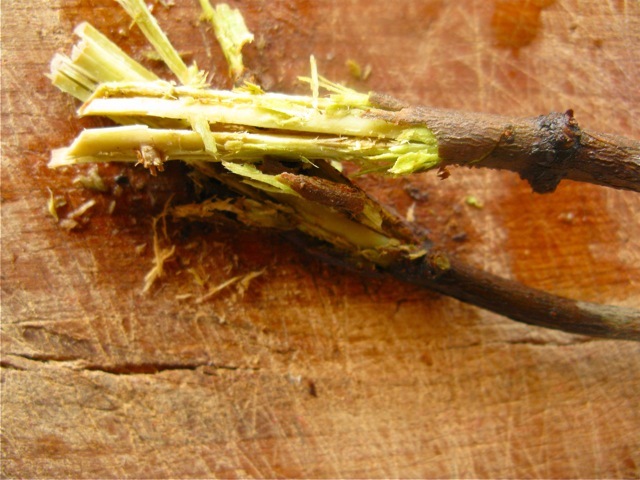 Understanding bud types is critical to knowing how to cut woody stems. Alternating bud patterns have buds staggered up and down the stem. Opposite buds, as the name implies, have buds opposite one another on the stem. Look for these patterns and study them. When pruning, the first key is cutting to just above a healthy bud on a strong, healthy stem. It is important to make the cut close enough to avoid leaving a stub of wood above the bud, (with few exceptions, this will die back and rot), and it is always important to avoid cutting too closely, (injuring or killing the new bud, resulting in die back and rot). Ideally the cut is made just slightly above the bud. Alternate buds will require a slightly angled cut, directed away from the bud. 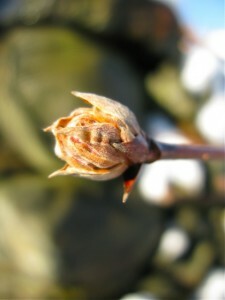 When outward growth is desired on an alternate budding specimen, (in most cases), the cut is made directly above, (but not touching), an outward facing bud. The new growth will be in this direction. With opposite buds, (buds directly opposite each other on the woody stem), a straight cut is made directly above, (but once again, not touching), the buds. When making a thinning cut of a branch, or limb, always make the cut just beyond the branch collar, (the rough ridge between the branch and the trunk), and at a slight angle. 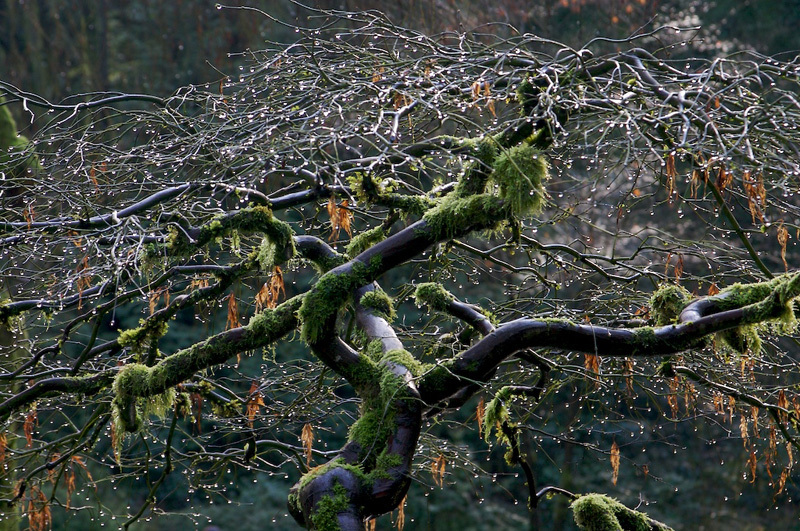 With larger limbs, first remove some of the heavy, excess branches. This is advisable both for safety and ease. It is also good practice to make three cuts on limbs of significant size. First, a few inches away from the collar, make a short undercut to prevent a tear to the bark, followed by a top cut through the branch. The stub may be pruned off last, in a clean line with the collar. It is important here to avoid leaving a stub of branch, and equally important to avoid a flush cut to the trunk, removing the collar. This is why controlling the removal of the branch with at least three cuts is the best practice. There are three main types of pruning cuts: pinching, heading and thinning. Pinching stem tips will stimulate hormones directed toward the remaining side shoots. This type of pruning is frequently used on perennials such as mums, for bushy-growth, plants such as tomatoes for fruit, and for flower or foliage production. Pinching directs energy to branching, flowers and fruit, and makes lanky shrubs fuller. Heading cuts shorten branches. The more you head cut a branch, the more vigorous the new growth will be below the cut. Hormones quickly kick into gear to insure the plant’s survival. This is important to keep in mind when trying to keep an unruly plant in check, as certain plants are stimulated by severe pruning, and will become shrubbier faster. If you do not desire this sort of growth, aggressive heading cuts are counter productive. Dramatic heading cuts are important in creating hedges, for example, or to stimulate leaf production on plants grown for foliage and stems, (such as ornamental sambucus, salix and red twig dogwood). The third type of cut is the thinning cut. This type of pruning eliminates a branch entirely at the ground, or by removal just past the branch collar. As the name implies, this cut thins a tree or shrub, and is intended to lean out bushiness and undesirable growth. Some examples of this cut’s use are for the removal of damaged limbs and crossing tree branches, suckers and water spouts or with shrubs, to provide air circulation inside a dense mass. The seasonal timing of cuts will be a major factor with successful pruning. Removal of damaged and diseased wood can and should happen whenever a problem is noticed. Other pruning depends on the plant in question, and the desired result. For most deciduous trees, the best time for structural pruning and renovation is in late winter, (late January to mid February in New England for most species), when trees are dormant. 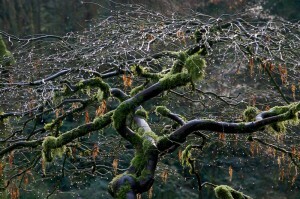 Trees with heavy-running sap should never be pruned during the spring thaw in late February and March, (such as maple and birch trees, for example). Light aesthetic pruning and the thinning of undesirable new growth, such as waterspouts and suckers, can be done on most trees and shrubs during the summer. The thinning of waterspouts and suckers is easiest when this growth is new and soft, and thinning cuts to the trunk or main branches will prevent new growth. This type of thinning is best done when those undesirable branches appear. Evergreen trees, and conifers in general, are pruned in spring before their flush of new growth. Some ornamental conifers may also be pinched to produce bushiness as new growth appears. In general, most ornamental shrubs are pruned in spring. 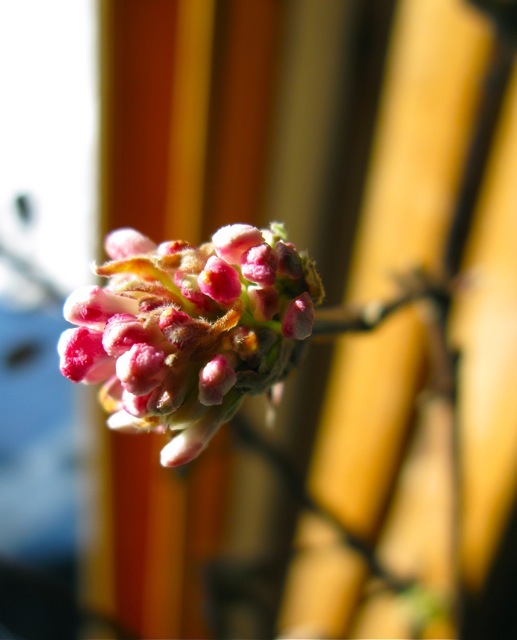 Those shrubs blooming in spring are pruned immediately following bloom, (lilacs for example, must be pruned immediately after blooming, or the following year’s blossom may be sacrificed). 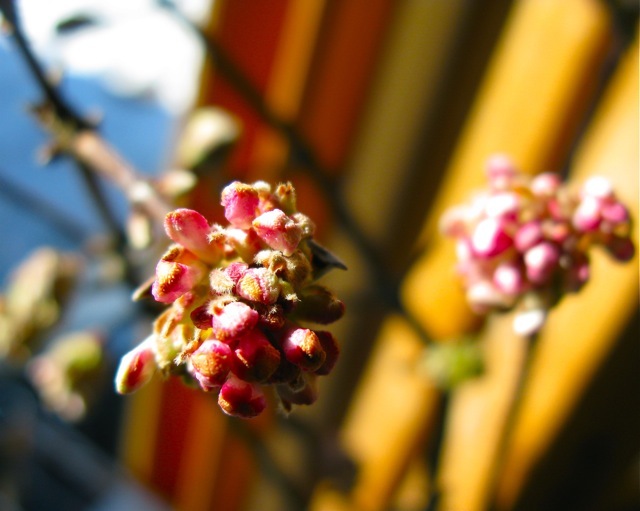 Late-blooming shrubs are pruned in early spring, before they set buds, (clethera for example, is pruned early in the season just before growth begins). 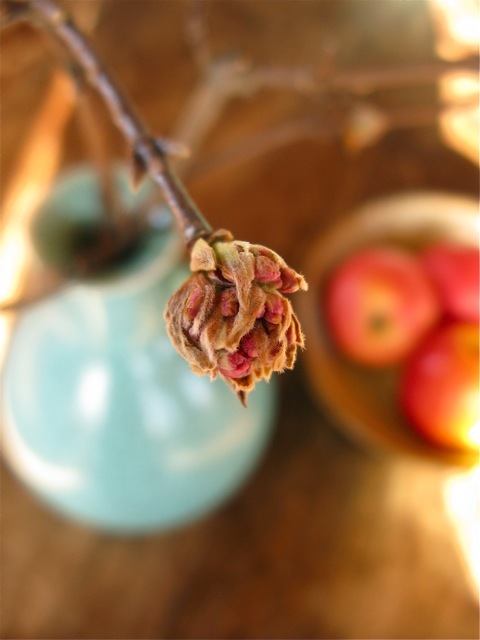 Always research your flowering shrub to understand when and how it blooms, on new wood or new growth on old wood. Some trees and shrubs require minimal pruning for best results, and others demand a more aggressive approach. When making cuts, it is important to have very sharp, well cleaned, (with rubbing alcohol), pruners. Any cut must be very even and smooth, with no jagged edges. When pruning, the gardener is creating a wound. The plant will respond by protecting itself, and forming a callus to seal the wood. A woody plant calluses fastest over the least surface. It is always best to prune branches when they are still small, and to make clean cuts. Clean cuts prevent trapped moisture and rot in crevices, and help discourage disease and insects. After you prune, do absolutely nothing to seal pruned branches. A properly pruned tree or shrub will callus naturally. A clean, dry cut will allow the plant to quickly callus. Moisture and wraps are generally the enemy of the callus and the friend of disease. There are a very few exceptions, (such as elm), but in general, remember that a clean dry cut is the best course of action in pruning. Practice of these basic principles and rules will prepare the gardener for beginning the necessary damage repair, renovation and aesthetic pruning of woody plants in the garden. Remember that engaging in the act of pruning will build your confidence. 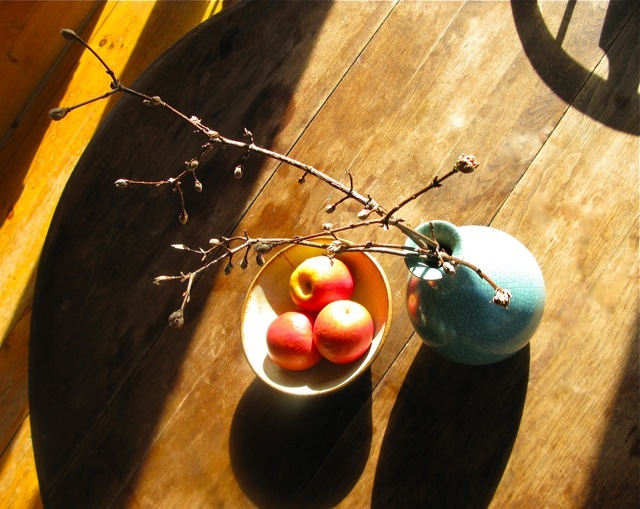 Study branches, research specimens, and practice on undesirable, broken or wasted wood and plant material. Buy the best pruning tools you can afford, and care for them well. With practice any gardener can learn to approach a tree or shrub with pruners, and correctly cut a tree or shrub with care and confidence. Remember that neglect will ruin a woody plant as surely as incorrect pruning. Trees and shrubs are important and valuable assets in your garden, learning to correctly care for them with pruning will insure your success with these plants and the long term value of your investment. You are currently browsing entries tagged with basic pruning for gardeners at The Gardener's Eden.